Click on your community: Alain Cushman; Bermuda Square; Boca Rosa; Dingman Acres; Fifth Avenue Townhomes; Golden Harbour; Kings Court; Kinney and Gates; Lake Wyman Shores; Left Bank Estates; Ocean Heights; The Indies; Whisem and Boca Villas. Set right in the heart of Boca Raton, Mizner Park area or as it is also called the Golden Triangle area is one of the most exquisite destinations for the dignified residents of the city and their visitors, and a most luxurious place to buy a home. With sprawling palm trees, gorgeous boutiques and five-star fine dining & entertainment, Mizner Park is the centerpiece of this most distinguished beach town. Read more about luxury homes for sale in Mizner Park / Golden Triangle area or browse through our Boca Raton MLS listings below. Stroll through the Boca Raton Museum of Art or enjoy live entertainment at the Mizner Park Amphitheater. The beach is never far either! And with more than 40 restaurants and shops to choose from, the options are laden with luxury, and the entertainment bountiful. What once started as a nearly 30-acre “mixed use” center in January 1991, Mizner Park / Golden Triangle area has brought true pizazz to downtown Boca Raton. Named for Addison Mizner, the architect who built Boca Raton from the ground up, it has single-handedly helped blossom the area from just 73 residential units and some of the lowest office rents in the country to a top spot on American Planning Association’s Places in America list. 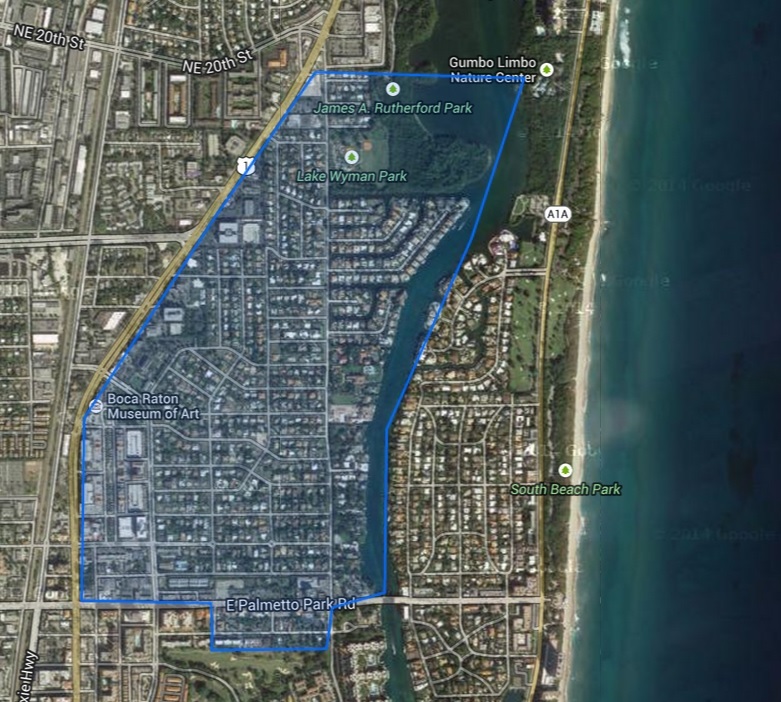 In just ten years after Mizner Park’s development, downtown Boca Raton grew to have 689 units downtown with 900 more under construction and office rents were the highest in all of South Florida. Nearly 300 of those homes and 262,000 square feet of office space exist in Mizner Park / Golden Triangle area alone today. Beautiful spiraling staircases, sprawling marble floors and state-of-the art amenities are characteristic of homes and condos near Mizner Park / Golden Triangle area in Boca Raton. The area has beautiful luxury subdivisions that are high in value because of their prime downtown location and proximity to the beach. Contact us today to learn more about Mizner Park / Golden Triangle area homes for sale. Find the most recent listing information and more! If you’re looking to own or sell your luxury home, rely on the experience of Jean-Luc Andriot and his team of professional realtors at Keller Williams. Call Jean-Luc today at 561-213-9008. He and his team specialize in luxury properties, including luxury condominiums in Boca Raton, Highland Beach, Delray Beach, Gulf Stream and Singer Island.